The International Monetary Fund said it expects Egypt to keep its monetary policy tight to ward off against another spike in inflation, adding that while the nation has made significant gains in implementing its economic program, it remains vulnerable to a broader aversion to emerging markets. The warning in the fund’s fourth review of Egypt’s economic program comes as the government plans further cuts in energy subsidies by the end of the current fiscal year in June. The measures, in tandem with seasonal factors such as the holy month of Ramadan in May and the Eid holiday, are expected to result in a fresh spike in consumer prices. The IMF, which provided Egypt with a $12 billion lifeline in 2016 that helped restore investor confidence in the the Arab world’s most populous nation, projected an average annual inflation rate of 12.8 percent for fiscal 2019-20. It also raised its projection for the the current fiscal year to an average 15.8 percent compared with 14.4 percent outlined in its third review. Annual headline inflation accelerated to 14.4 percent in February -- a rise that the central bank said it would monitor even as it held the benchmark rate unchanged in its last meeting after an earlier 100-basis point cut. The central bank hasn’t released inflation projections for fiscal 2019-20 and instead has said it’s targeting a rate of roughly 9 percent in the fourth quarter of 2020. 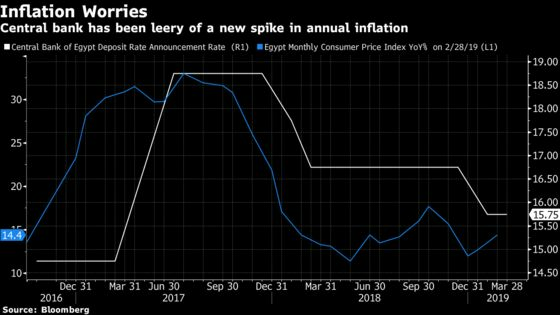 Egypt’s decision to float the currency and begin slashing fuel subsidies in 2016 set in motion a surge in inflation that rocketed to over 34 percent, before easing back gradually last year. The central bank had resisted cutting rates -- keeping them at levels that helped drum up investor interest in local debt. A wariness about loosening monetary policy, however, has also affected efforts to boost the private sector -- a key part of the broader program -- by making it more expensive for companies to borrow from banks. In a hint that there may be an easing in that direction, non-oil sector business activity showed a small increase in March, with the Emirates BND Purchasing Managers’ Index rising to a seven-month high of 49.9. A reading of over 50 suggests an expansion in growth. The PMI reading is expected to improve over the rest of the year, said Daniel Richards, MENA economist at Emirates NBD. “This will in part be fueled by easing monetary policy,” with the central bank expected to enact more cuts over the course of the year after its last reduction.